Online Astrology jewelry and gemstone recommendation tool finds the right gemstone favorable to current dasa bukthi period in your Tamil astrology chart. In Tamil astrology, gemstones are used as remedial measure to counter the negative effects of current ruling planets. It is believed that by wearing these prescribed gemstones you can overcome the obstacles in your chart. Astrological jewelry and astrology gemstone in many ways are healthier, stylish, etc. However choosing the right gem depends on the current planetary positions and its ruling planet. Ring and pendent are ideal jewelry for astrological purposes. 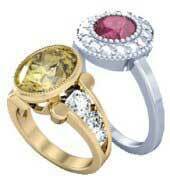 Rings and pendants can be designed to hold the center stone to touch your skin. Submit your birth details and find out your astrologically favorable gemstone for your astrology jewelry based current dasa period and its ruling planet.